Do your radiators have cold spots? Are they slower to heat up? If this is the case, you may need to bleed your radiators. This will ensure they are working as effectively as possible. The good news is, this is a relatively simple task. Why Do You Need To Bleed A Radiator? Air bubbles can get trapped in radiators. This prevents the hot water from circulating effectively, resulting in your radiators not getting as hot as they should, or cold spots at the top. This has an impact on how well radiators heat your rooms and can even mean they make strange noises! By bleeding them, you release the air that has built up inside the radiator. This will get them back to full efficiently as the water will be able to circulate properly. You will need a few tools to do this. First, you will need a radiator key or, in some cases, a screwdriver. These are available in hardware shops to buy if you can’t find one. You will also need a bowl to catch the water that escapes. It is also advisable to have a towel handy to protect the surrounding area. Turn on the central heating and make sure that all the radiators are turned up to maximum. You then need to check each radiator for level of heat and cold spots. It is worth bleeding any radiators that have noticeable coldness at the top, make strange noises or are taking significantly longer than the others to heat up. Turn off the central heating but keep the valves on your radiators open. It is very important to turn off the heating before you attempt to bleed any of the radiators. Once the radiators have cooled down, you should find the bleed valve at one of the ends at the top of the radiator. Some radiators will require a screwdriver to open, while others will require a radiator key. Water will be coming out from this valve so ensure you have your container handy to catch it and also protect the area with a towel. You will hear the air escaping in a hissing sound. This will be followed by a solid release of water. Once the sound stops, and you see a solid stream of water, you should tighten the bleed valve. Once you have completed the process on each radiator and re-tightened all of the valves, you can turn the heating back on. 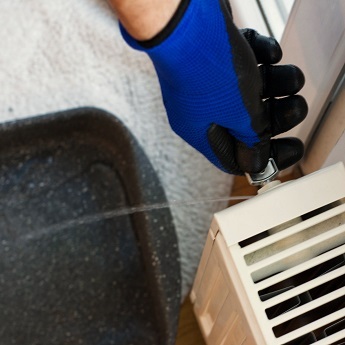 Check for any leaks, and don’t worry if you need to bleed some radiators a second time. The bleeding process may have an impact on boiler pressure, which can result in some radiators not heating up at all. If this is the case, you should adjust the boiler pressure, so it returns to the recommended level. If you have any concerns, or would like a heating engineer to come out to you, please contact us today on 020 8395 8060 or visit our website.